The Last 10 Miles | Run, Pegleg, RUN! Today I ran the last 10 miles of the Marathon with the Prospect Park Track Club. Next week, after 16 miles, I will be running it again – with my Mom. And I will be running with all of the people who are supporting me. Also running with me in Mile 16 will Peter & Megan. Mile 18 is with Julie. Mile 23 will be Juno’s special mile. Mile 24 have Dylan & Justine by my side. Russell Rosier is with me up that final huge hill in Mile 25. 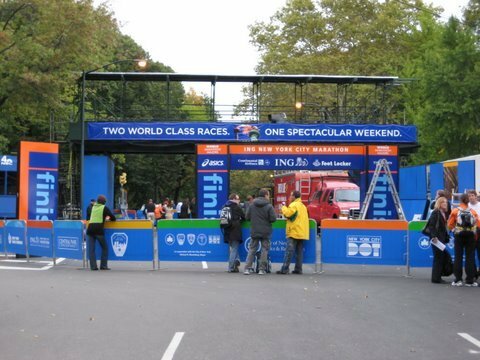 Lois & Jim will be running along Central Park South. And back into Central Park, Bobby and The Gate will be pushing Pegleg to the end where all my Parents will be waiting for me. But Mile 17, 19, 20, 21, and 22 are feeling lonely right now. Who else will run with me? Today’s run was the Prospect Park Track Club’s Last 10 Miles of the Marathon. We met at the Food Emporium under the Queensboro Bridge at 7:45 to start the last 10 miles of the marathon course at 8. A huge group of us arrived. Support vehicles were stuffed with our clothes and we started in waves. I took off in the first group. It felt like I had a pebble in my shoe so I pulled off to empty it, sprinting to catch back up to Pieter and Mike. Don’t think that I ran a 5:07 second mile. Looking at the map, I appear to have some crazy curves up 1st Ave, but I didn’t. I think the numbers are accurate after that though (which means Mike helped draw me into a tempo run for the last 2 miles). What did this help me to know? The last 5 miles are hard: uphill all the way (it will seem). I will experience the Metropolitan Museum of Art like I haven’t before: torture. And those last 100 yards in the Park, a little hump just to remind you this is supposed to be hard. Hopefully I’ll have enough time under my belt at that point that this can be enjoyed. One week and we will see. I’m going to need all the help I can get. If you can run with me for any of those final miles, please do!